With the exception of the prizes for the Best Actor, Best Actress, and Director of the Winning Play, the winners hold their trophies for twelve months and are then called upon to defend them at the following year’s Festival. THE FIRST PRIZE is the Welwyn Cup. It is sometimes referred to as the L. T. M. Gray Cup because it was presented in 1929 by Dr Gray, the then Chairman of the Welwyn Garden City Urban District Council and one of the most enthusiastic and generous of local drama supporters. The cup was designed and made by J. P. Steele, a Welwyn Garden City craftsman, in his workshop in Bridge Road. THE SECOND PRIZE was originally a cash award only. From 1929 to 1931 it was three guineas (£3.15) and from 1932 to 1936 it was five guineas (£5.25). In 1937, in addition to the cash, there was awarded the ‘Amateur Theatre Trophy’ – the nature and provenance of which remains a mystery. 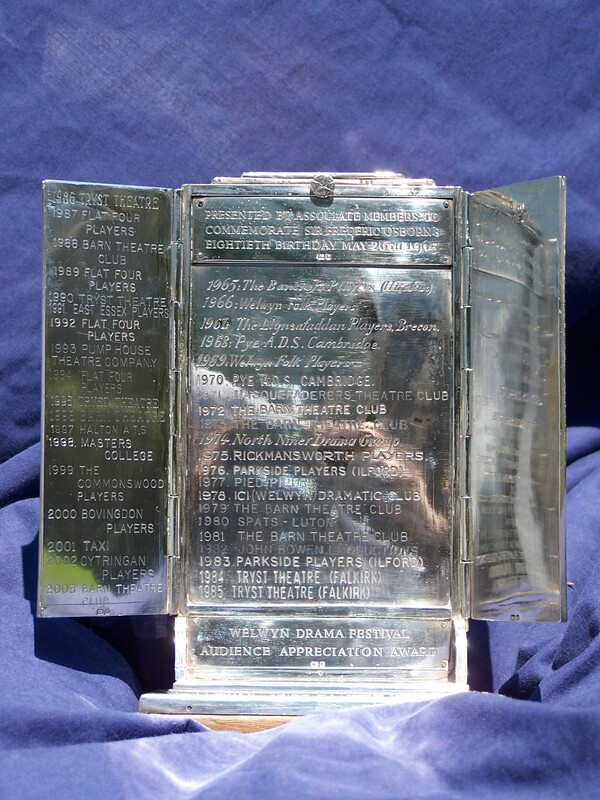 The Festival Committee Minutes record that the Amateur Theatre Trophy had been presented to the Festival Committee in 1937 and they decided at a meeting in May 1937 to award it as second prize. In 1948 the trophy disappeared from the Festival scene as suddenly as it had come, the Minutes of the time reporting merely that “it was agreed to discontinue the award of the Amateur Theatre Trophy as a second prize”. Mr J. P. Steele was commissioned to make a second prize trophy which the Committee agreed should be called the Parkway Trophy. 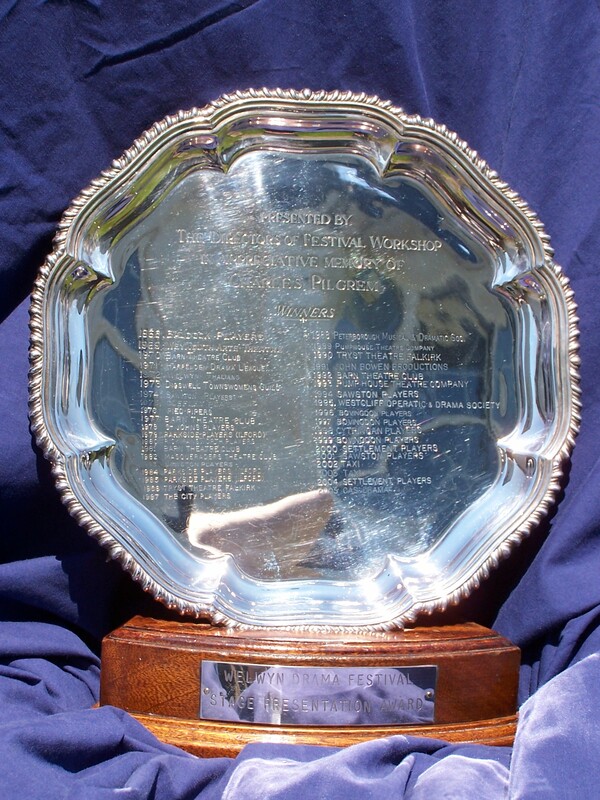 In 1980 the Parkway Trophy was renamed in memory of Roy Brewer, who had been closely associated with the Festival from 1930 until his death 50 years later and was Festival Secretary for ten years. THE THIRD PRIZE was first awarded in 1932. It was a modest cash award and remained so until festivals were abandoned during the Second World War. From 1946 to 1959 diplomas were presented to the teams placed third. 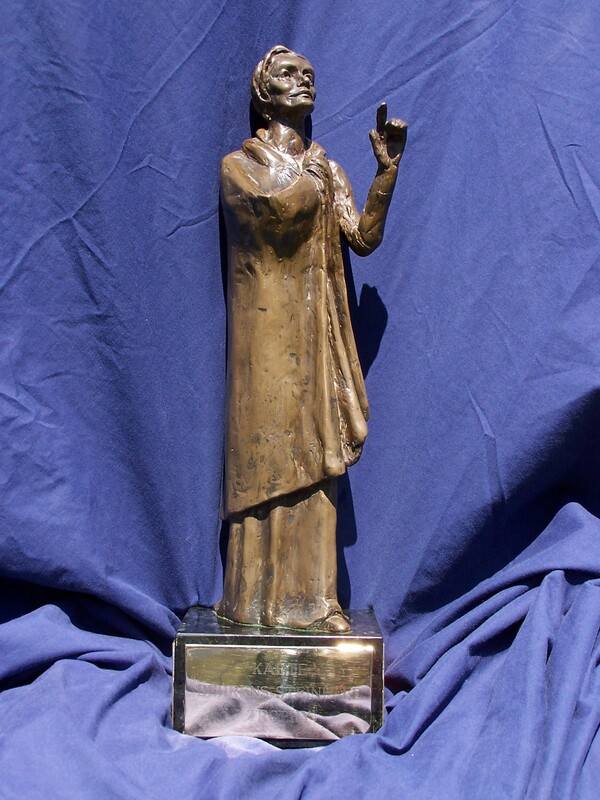 In 1960 the Margaret Osborn Trophy was created, named after the wife of the founder of the Festival. 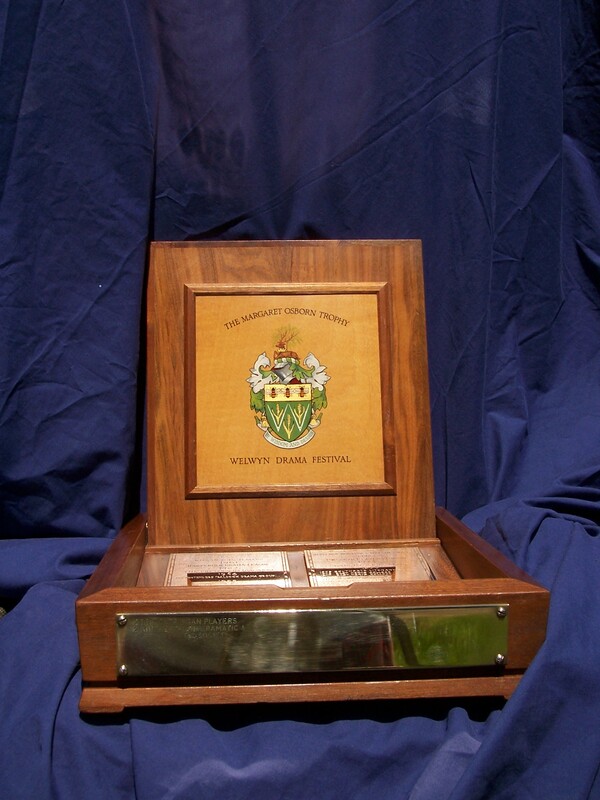 It takes the form of a wooden casket containing bronze plates engraved with the names of the teams which have won it and incorporating, with their permission, the Coat of Arms of the Welwyn Garden City Urban District Council. The casket was made by the Welwyn Craftworkers Guild. Lady Margaret Osborn died in 1970. 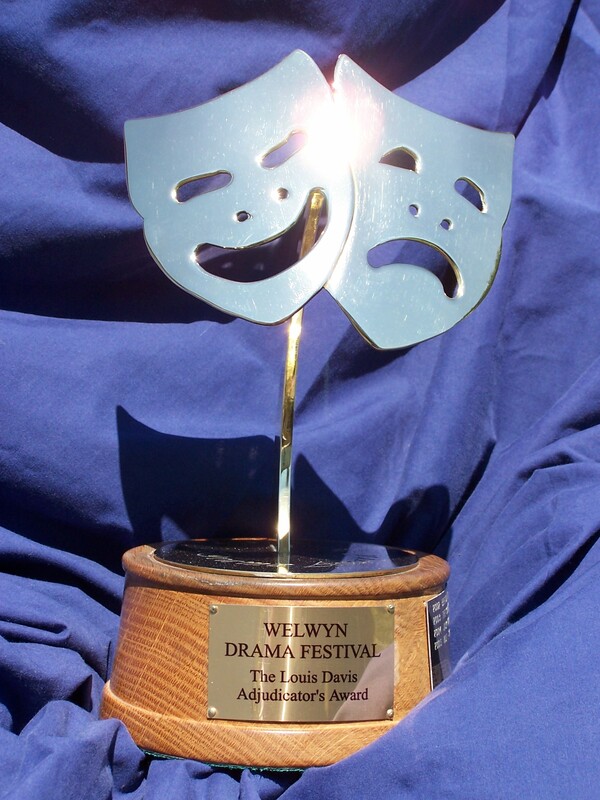 THE WELWYN AWARDS are won outright by the actor and actress who in the adjudicator’s opinion give the best individual performances during the Festival. They were specially designed silver medals, first awarded in 1954, to mark the 21st Festival. The design was based on the ‘City on a Hill’ motif, used extensively as the symbol of Welwyn Garden City in the town’s earliest days. The rising cost of silver medals eventually compelled their abandonment and the final pair, specially gilded, were awarded at the Golden Jubilee Festival in 1984. Since then, the Winifred Butler Award (renamed in her memory in 1992) for the best actress and the Welwyn Award (for the best actor) have taken the form of engraved onyx paperweights. THE F. J. OSBORN AUDIENCE APPRECIATION AWARD is given to the entry which receives the majority of votes by Festival season ticket holders and was first awarded in 1962. 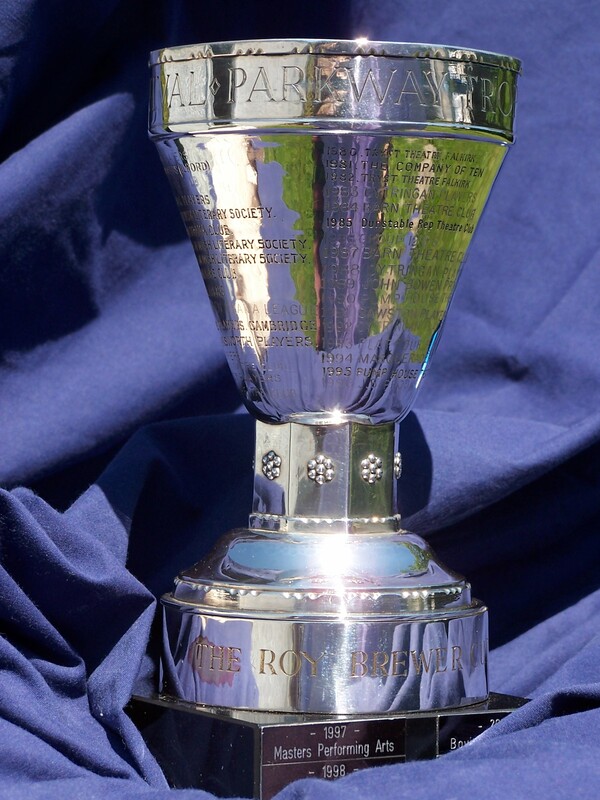 To mark Sir Frederic Osborn’s 80th birthday during Festival week in 1965 a permanent trophy was devised. It is in the form of a silver book-like triptych, each section of which carries the names of the winners. 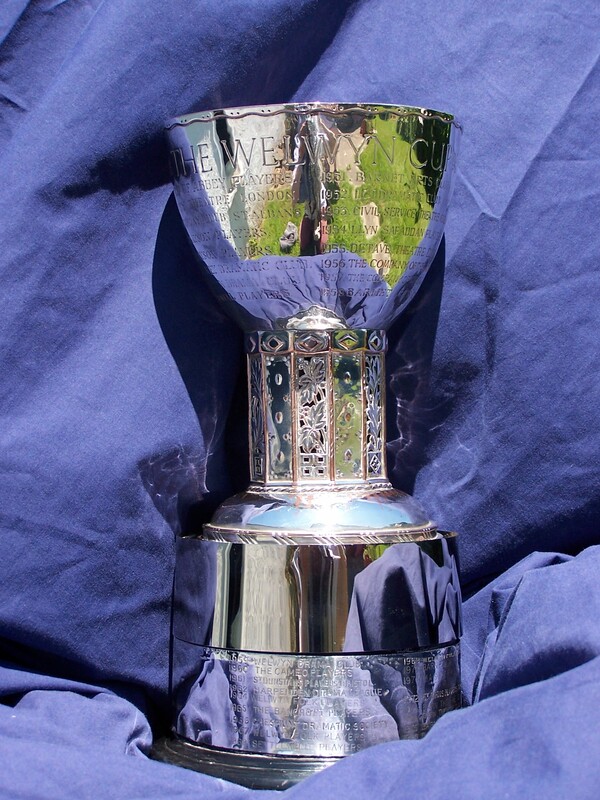 The trophy was provided by the Festival Subscribers Association and was designed by Mr F. Newland-Smith, a nationally-known artist and craftsman who lived in Welwyn Garden City. THE BEHRENS-STEINFELD TROPHY is awarded to the Producer (nowadays normally termed ‘Director’) showing the most complete and imaginative approach. It was first awarded in 1966 in memory of Kaete Behrens-Steinfeld who died in 1965, shortly after the 1965 Festival. She first came to the Festival in 1947 and for eighteen years brought two excellent productions by societies from North Hertfordshire. The trophy, in a likeness of Kaete, was donated to the Festival by the Baldock Drama Group, with which she was associated for many years. It was created in bronze by Kathleen Parbury, arbs, and was subscribed for by Kaete’s friends in this country and abroad. THE CHARLES PILGREM TROPHY is for the Festival entry which gives the best stage presentation. It was first awarded in 1968 in memory of Charles Pilgrem who died in the summer of 1967, having been the Festival’s Stage Director since 1958. His association with the Festival began in 1946. The trophy was donated by Festival Workshop, of Welwyn Garden City. It takes the form of a silver plate on a stand. THE NEW PLAY PRIZE was, from 1930 until 1986, a cash award. 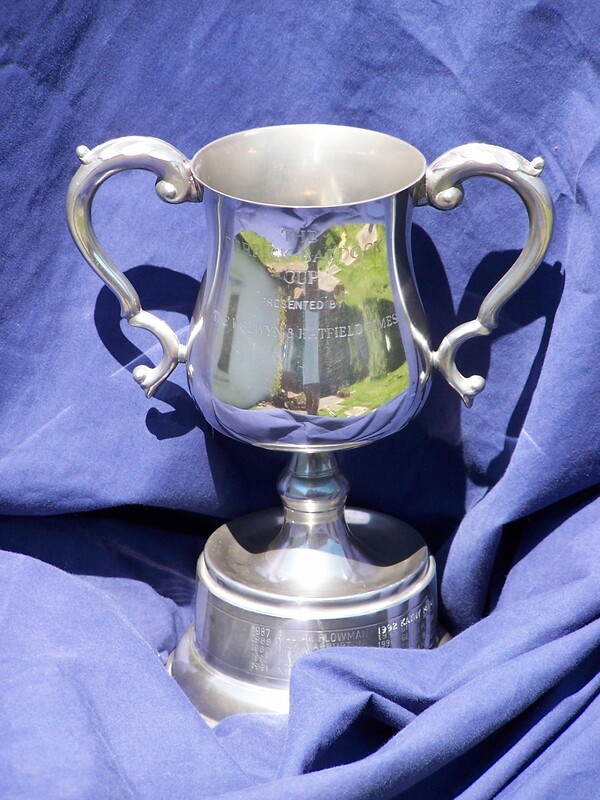 In 1987 the cash prize was supplemented by the permanent DERRICK BALDOCK CUP. This was awarded for the first time at the 1987 Festival and was donated by The Welwyn Times in memory of Derrick Baldock. He had been that newspaper’s admirable drama critic for fifteen years and collapsed and died in the Barn Theatre in 1987. The cup is awarded – with the cash prize – to the author of the Festival’s best unpublished play which has not previously won a new play prize, nor been given any professional performance. THE Peter Shatford Award was donated in 1998 by long-term Festival competitors from Kettering in Northamptonshire, the Cytringan Players. It is to commemorate their talented and dedicated producer for many years, Peter Shatford, who had died the previous year. 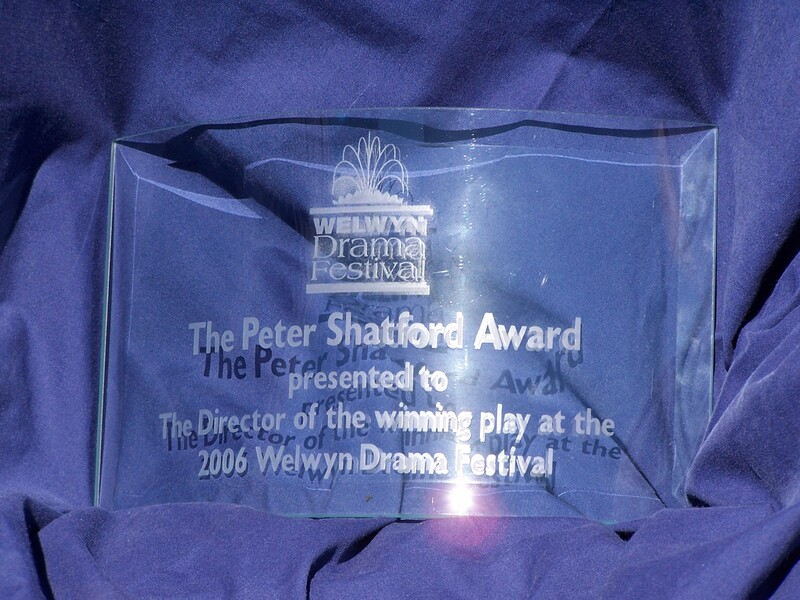 The trophy is a curved block of engraved glass, and is awarded, in perpetuity, to the Director of the winning play. (Although very often he or she is also the recipient of the Behrens-Steinfeld Trophy, the ‘double’ is not automatic, so the Peter Shatford Trophy can come as a welcome personal recognition of the successful outcome of the Director’s work). THE LOUIS DAVIS ADJUDICATOR’S AWARD was donated by Louis on his retirement as Chairman (and ‘elevation’ to President) at the end of the 2000 Festival. It is a ‘floating’ award, to be given, at the discretion of the Adjudicator, to a person, persons or team which, in his or her opinion, has made a special contribution to the success of the Festival.